1 October 2014, at 8:21a.m. DENMARK - The greenhouse gas, methane, can be turned into pork instead of contributing to global warming, according to Aarhus University scientists, who are working with industry on the production of an innovative and environment-friendly protein feed for pigs to replace imported soybean meal. Development of a new protein feed can reduce Denmark's soybean imports. Imagine that in the future bacteria, natural gas and minerals form the basis for your pork chops. Does that sound very far-fetched? That is nevertheless a possibility waiting just around the corner, with the development of a new protein feed for pigs to replace, for example, the soybean meal that is imported from distant countries. This means that the protein supplement for pigs can be produced in Denmark rather than having to rely on an ingredient that may involve the clearing of rainforests. In a new project financially supported by InnovationsFonden, scientists from Aarhus University are working with the company UniBio A/S - which produces a special protein feed based on bacteria - as well as Technical University of Denmark, University of Southern Denmark and the farming cooperative, Vestjyllands Andel, on the further development of UniBio’s protein product so that it can be tailored to the needs of the pigs. This product will have a significantly lower impact on the environment than the most commonly used source of protein – soy – due to a reduced use of dietary protein. One of the participants in the project, Professor Hanne Damgaard Poulsen from the Department of Animal Science at Aarhus University, explained: "The global population is growing both in terms of numbers and wealth. That means a growing demand for meat. The growing demand also means an increasing demand for protein sources to feed the animals, which puts additional pressure on the environment and climate. Hence the need for new thinking." "By producing a protein feed based on bacteria and natural gas, the impact on climate and environment from meat production can be significantly reduced." The project aims to develop protein products that are tailored to the pig’s amino acid requirements. The products will be based on a protein feed produced by the bacterial species Methylococcus capsulatus. This species eats methane and converts the gas into biomass with a high crude protein content. This biomass can be converted into a protein granule that can be used in pig feed. UniBio has patented the design of the fermentation facility that produces the single-cell protein, UniProtein®. Now the product needs to be tailored to the pigs' requirements and the environmental benefits identified. The building blocks of the protein are amino acids. 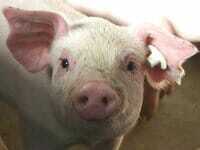 The individual amino acids added to the feed are those that the pig needs in specific quantities. By adjusting the feed composition to meet these individual requirements, you avoid giving the pig more protein than it needs. In this way, you also avoid nitrogen from the excess protein being excreted in the manure and ultimately being applied to the field where it may harm the environment. By experiments on pigs, Professor Poulsen and her colleagues at Aarhus University will identify the amino acids that are essential when designing protein feeds for pigs for the different stages of their lives. The scientists will also ensure that the new protein products are tested on pigs and that feed digestibility and nutrient balance are mapped. By producing a protein feed based on bacteria and natural gas, the impact on climate and environment from meat production can be significantly reduced. In the major oil-producing and oil-consuming countries, much natural gas is being used that could be better used for the production of the new protein feed. By tailoring the protein to pigs' requirements they will be better able to utilise it, which will benefit both the pig and the environment. According to a report from DCA - National Centre for Food and Agriculture, Denmark uses around 1.5 million tonnes of soy for animal feed per year. This means that an area measuring roughly 7,000 square kilometres is used for the cultivation of soybeans. By replacing soy in the diet with the new protein product, the drawbacks associated with the production of soy can be eliminated. The 3.5-year project has a total budget of DKK28 million, DKK15 million of which has been granted by InnovationsFonden. The project is a collaboration between Aarhus University, Technical University of Denmark, University of Southern Denmark, UniBio A/S and Vestjyllands Andel.